A video installation dedicated to those enduring memory deficiency. Special thanks : Bruno Arfuso, Pascal Collé, Bérengère Dalbies, Rachel Even, Charlie Gasq, Hilde Hamel, Valérie Hasson-Benillouche, Ingrid Laurent, Patricia Lopez, Mathilde Mauvilly, Martine Rajzman, Philippe Robaut, Philippe Robert, Laure Santori, Laura Siccardi, Malika Ziari, and all the persons who participated to the workshops and kindly accepted to share their impressions with me. The work of art is freely available to the health care team for workshops with the elderly. 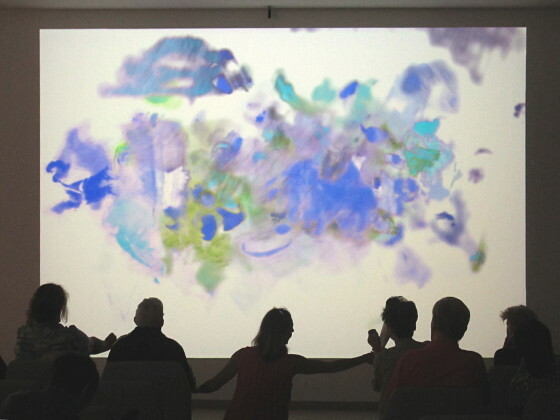 In the dedicated room, a large scale abstract image is projected on the wall, which reacts to people in the room. 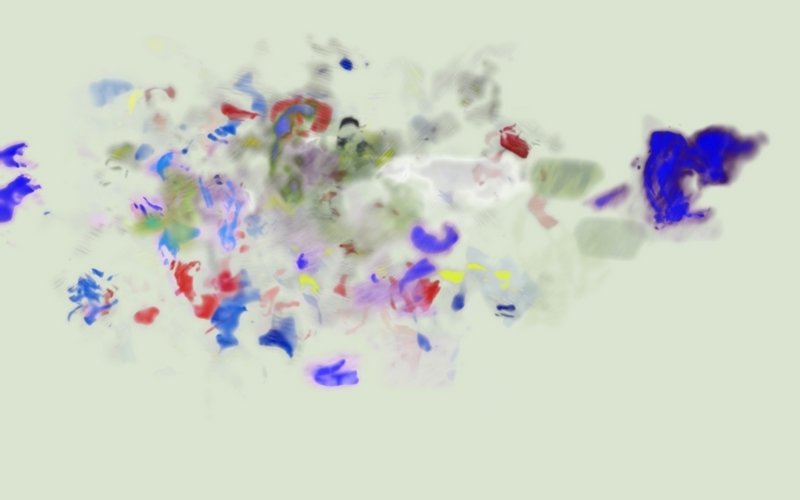 Depending on the amplitude of their movements, video fragments are revealed, which then progressively disappear. The participant can thereby immediately realize his action. At the same time traces that linger are at times left in the pictorial space, without one being able to discern how these residual images are created. Once fully realized, these images are autonomous and begin their own life: they move and change color over extensive time spans, ranging from half an hour to several days. Outside workshops, the work continues to live. 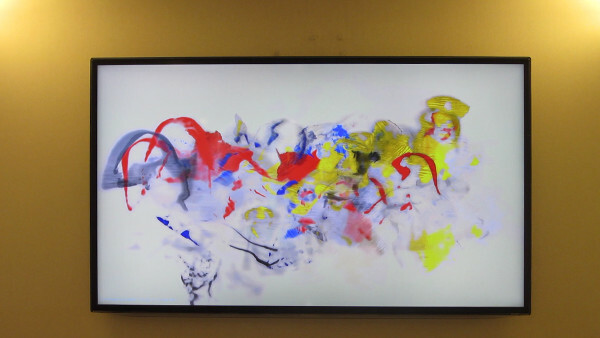 Another screen is located in in a publicly accessible space, which makes it possible to follow the evolution of the image, with a brief delay. In the long run, the visual traces could build up a memory of the workshops, but after some days, these begin to fade and eventually disappear. The memory is purposefully left ephemeral, so that only the regular presence of the patients by the work of art can sustain the image. If there is no movement in the workshop, all will end-up as a series of uniform monochromes. La Démesure du Possible does not stem from a therapeutic intent. It is simply inspired by the impaired persons, and it is for them, in the same way we write to someone, sending regards and thoughts. The revealed image fragments are the generic items of a visual set, whose non geometrical nature and fortuitous links are close to what I realize as my own memories. By playing with this abstract metaphor and the concrete remembrance of the present moment, this installation is about time and its processes, visible or invisible, passive or active. It would be better to say times, because we are made of multiple time scales, mankind, civilization, language, culture, and of course History, and also time of his own history, that of his family, time of present, time of our thoughts, of our possible or impossible actions. The disproportion certainly lies there, in what affects us at the closest.